Imagine a new world. A new planet. At Axiom, we are on the cusp of discovering the unknown. In a renewed interest of searching for life on habitable exo-planets, made possible by advancements in recent technological breakthroughs, Axiom is prepared to make this possibility a reality. Axiom research has uncovered terrestrial planets that exist beyond our solar system, all of relative densities, masses and sizes conducive to surface materials and gravities that could yield the environments hospitable to life. With this unprecedented breakthrough, Axiom will proudly lead society into the new frontier of discovery. 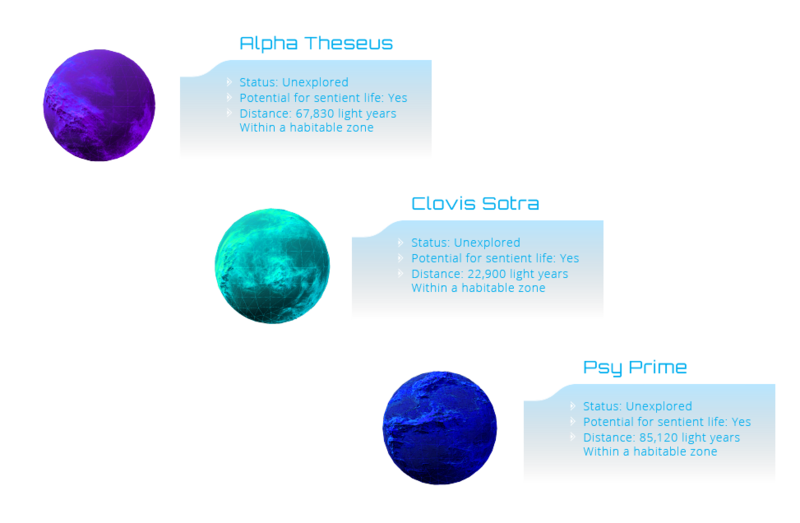 Exo-planets Alpha Theseus, Clovis Sotra and Psy Prime are our current targets of study. Unrivalled by previous research capabilities in preparation for deep-space travel, we have discovered internal-structural details of these exo-planets’ compositions that are promising.At the right distance from a solar system’s heat source, one or two such planets could theoretically possess water and temperature variances that could support life. Sophisticated chemical testing will point the way forward to discovering a habitable exo-planet. Water means life, and with a planetary object possessing similar natural conditions to our own world, the opportunities for compatibility and cross-diversity start to become imaginable. This is the most exciting time in Axiom’s history, and the thought of exploring new worlds and beings defines our ingenuity. At Axiom, we are here to dream big. The Station is coming to VR - get an email when it is ready!